After two weeks of military assault on the northern Iraqi city of Mosul, there is no sign of a definitive breakthrough. The attackers, a wide-ranging coalition of international forces, have made some incursions into its eastern environs. But the main part of the city, west of the Tigris, remains firmly under ISIS control. If ISIS does not withdraw, as Abu Bakr al-Baghdadi’s rare message has indicated, the most likely development is the greater use of intensive firepower to support ground troops in ejecting them. The United States and its coalition partners have certainly brought in all the weapons to take that route. Such an approach may kill many civilians and damage much of the city. That, after all, was the pattern in Fallujah and Ramadi during earlier stages of the anti-ISIS campaign. “Here at Qayara Airfield West, the thud of outgoing fire from American M109 Paladins and CAESAR howitzers manned by French troops stationed at the base is punctuated by the occasional whoosh of rockets launched by a U.S. Army HIMARS (High-Mobility Artillery Rocket System). 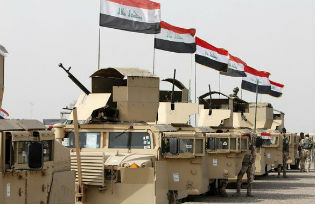 The multiple-launch rocket systems have unleashed more than 200 rounds in support of Iraqi ground forces since the weapons started shooting from this area 10 weeks ago, first at a nearby base and then here” (see “Destruction, sounds of battle attest to US support for Iraqi offensive on Mosul“, Starts and Stripes, 31 October 2016). HIMARS is a multiple-launch rocket system which is highly accurate in all weathers, during night and day, and can operate when strike-aircraft and helicopter-gunships are grounded. The fact that French troops are operating at such a forward base is a reminder that this really is a coalition with a number of western states involved, and a contrast with the country’s refusal to get involvoled in the invasion of Iraq in 2003. One result of the media concentration on Mosul is that there is far less coverage in the western media of Russian and Syrian regime operations to take control of eastern Aleppo. The Russians have now announced a brief pause to allow rebels to leave the city before what they describe as the final attack, which would be prosecuted by intensive (and often inaccurate) air-power in support of Syrian ground troops. A surprise at this precise point, however, is that a coalition of rebel groups has actually taken the offensive to open a route to the same eastern part of the city, which aims essentially to break the Assad regime’s siege. This follows a fresh report from a normally reliable source, that rebel forces composed of several militias have been operating with some effect – and that many of these are motivated by a very strong Islamist outlook. This could well be be significant. Such a development amplifies a trend noted in a recent column in this series (see “ISIS’s squeeze, al-Qaida’s return”, 13 October 2016). It reported that the al-Nusra front in Syria, now renamed Jabhat Fath al-Sham and still orientated to al-Qaida, was part of a repositioning of many groups across the region associated with al-Qaida. The common trend was a rejection of the extreme violence of ISIS, and attention to variations in local and regional cultures, and religious attitudes. An effect of this departure from the rigidity of ISIS was that paramilitary groups such as Jabhat Fath al-Sham were attracting more support, and proving increasingly effective in their actions against the Assad regime. This process has now accelerated, and being tested in eastern Aleppo where a coalition of Islamist groups, Jaysh al-Fath (Army of Conquest), is at the military forefront. In a wider perspective this has created an extraordinary outcome. Hundreds of miles to the east of Aleppo, a huge international military force – involving multiple Iraqi contingents, United States and French combat-troops, special forces from these two countries plus Britain, Kurds, Shi’a militias and the Iranian Revolutionary Guard – is trying to defeat ISIS in Mosul. The American plan is then to move on to Raqqa in northern Syria. If these operations are eventually successful they will be seen as the end of the much-vaunted ISIS caliphate. Some analysts dispute this: they see ISIS as being ready to transform itself into a virtual organisation possessing the aura of having created a caliphate in the face of the world’s most powerful armed forces. As this process of mutation unfolds, the al-Qaida-linked jihadist movements could well expand, and in Syria at least, move to centre-stage. Thus the western coalition in Iraq supports the government in seeking to defeat one major Islamist movement, ISIS, in Mosul, even as it strongly condemns the Russians in Syria for their assault on eastern Aleppo against another Islamist movement. Meanwhile, the US and Britain continue their strong support for the Saudi-led war in Yemen, conducted with bombing raids that show the same disregard for civilian casualties as do the Assad regime and the Russians. Whatever else western policy is, it is a gift to Vladimir Putin’s propagandists.